dip, dive and dodge your friends as you run the course and shoot at them instead of tag them with paintballs. It’s the perfect way to play tag with a little more of a challenge and a lot more fun. Hide and Seek – This game is all about outsmarting your opponent. You have to find that one little crevice or one spot where you can see the seeker without being seen. In the childhood game, it’s normally in a dark room and when you get found you have to make sure the seeker doesn&apos;t touch you. When you are an adult you get to go to The Zone and play laser tag where you hide from not one seeker, but everyone and run around a dark jungle arena with laser guns to find everyone and when you get everyone and win the game (because I know you’ll win) you can go grab a beer from Old Ox or Lost Rhino at the bar. Red Rover – I never liked this game as a kid because the one time I played it, my little brother and sister clothes-lined me when I ran over and I sprained my wrist, but everyone else seems to love it. I do, however, love the adult counterpoint of ziplining at the Evergreen Sportsplex new adventure course. Red Rover Red Rover zip on over on lines that will carry you through the air. 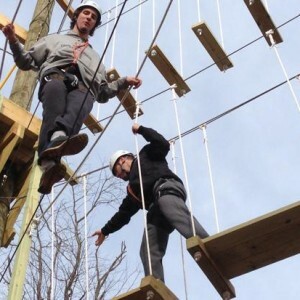 Build a whole package around the zip lining to include rock climbing and high elevation ropes courses! Red Light/Green Light – A game of skill, agility and the ability to stop all motion when you hear the dreaded words “red light”. I think it’d be much more fun if you were stopping at beautiful mountaintops and sceneries than trying to tackle your friend controlling the game and luckily Harper’s Ferry Adventure Center offers that kind of experience with their segway tours. Green light means go, as you ride off road over the terrain and up the mountains. Red light means stop, when you get to a beautiful scenic spot or spot a peaceful deer on the trail. Make sure to grab a quick picture and hashtag #LoCoVA and we might share it! Hopscoth – Hopscotch was the perfect game to play when the sun was shining and all you needed was some chalk and a rock. Jumping from square to square on one foot without falling over and losing one of your baby teeth (I was a very clumsy child). Instead of hopping around on the ground, you could be jumping around in a room of trampolines at Rebounderz. With over 24,000 square feet of trampolines you could do it with one foot, two feet or no feet as you soar through the air. Of course, as a child you would play games and then go inside for snacks and juice or milk. Now that you are enjoying these games as an adult you can go out with your friends and get some delicious craft beer or Loudoun wine and enjoy all that the area has to offer. Make sure to check out our brewery and winery pages to see which spot is closest to your new game. So get out there and find your inner child and play in LoCoVA!